When the religion of the Vedas became weakened due to the influence of less intelligent men who blindly performed ritualistic ceremonies and wantonly killed animals in the name of Vedic injunctions, Buddha appeared on the scene as a great reformer. Totally rejecting the Vedic literatures and substituting his rational, atheistic views, Buddha advocated the path of ahimsa —nonviolence and nirvana —the negation of reality as we know it— as the ultimate goal of life. Soon after, the philosophy of Shankaracarya overpowered Buddhism and spread throughout India. The authority of the Upanishads and other Vedic literatures were revived by Shankara and employed as weapons to fight the Buddhist doctrine. Interpreting the Vedas to draw a particular conclusion, Shankara established the doctrine of non-dualism, adwaita-vedanta, stating that all living entities were on an equal level with God. He prominently stressed those texts which afforded an answer to the rationalistic atheism of the Buddhists, yet the teachings of Shankara were also not wholly theistic, and thus a further unveiling of the ultimate reality was destined. That destiny was fulfilled through Sri Ramanujacharya. Ramanuja was born in India during the year 1017 A.D. when, according to astrological calculations, the sun was in the zodiacal sign of Cancer. His parents were Asuri Kesava and Kantimati, both from aristocratic families. Ramanuja passed his childhood days in Sriperumbudur, the village of his birth. At the age of 16 he was married to Rakshakambal. Only four months after his wedding, Ramanuja's father was struck with a severe illness and died. Upon the death of his father, Ramanuja became head of the household and decided to move to Kanchi, a holy city famed for its scholars and magnificent temples. In Kanchi there lived a scholar named Yadava Prakash, who was renowned for his scholarship in the doctrine of adwaita-vedanta, non-dualism. No one could surpass Yadava in his ability to explain Shankara's commentaries on Vedanta-sutra. 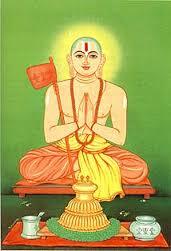 Ramanuja enrolled in Yadava's school and engaged in the study of Sanskrit and Vedic literature. Although not at all convinced by the Shankarite conception, Ramanuja learned his lessons well and soon became one of Yadava's favorite students. Thinking Ramanuja to be a sincere follower of the conclusions of Shankara, Yadava showed Ramanuja special affection. But that affection did not last for long. One day, after delivering a discourse on the Chandogya Upanishad, Yadava asked Ramanuja to massage his body with oil, as was the customary service to be performed by a student in those days. While giving the massage to his teacher, another student came to Yadava for some clarification on a point from the morning discourse. The boy had failed to grasp the meaning of the seventh verse of the first chapter, which began with tasya yatha kapyasam pundarikam evam akshini. Yadava proceeded to expound an interpretation which described the sublime qualities of the Godhead in a manner which was flagrantly objectionable. On hearing the words of his teacher, the heart of Ramanuja, which was full of love for the Supreme Godhead, was saddened, and hot tears streamed down from his eyes and fell on the thigh of Yadava. Looking up at the touch of the hot tears, Yadava could understand that something was troubling Ramanuja. When he inquired about Ramanuja's distress, Ramanuja replied, "O great and wise master, I have been sorely afflicted at heart to hear such an unbecoming explanation from a noble soul like you. How sinful it is of you to debase the Supreme, who is endowed with all gracious qualities and who is the source of all beautiful things in this world. From the mouth of such a learned man as yourself I would never have expected such a low and deceitful interpretation!" Yadava became so angry that he could hardly control himself. "Well then," he scorned, "maybe you would like to give your own interpretation since you obviously think you know better than I!" In a very gentle voice Ramanuja replied, "Revered sir, there is no need to give a low-minded interpretation to the verse when the real meaning is direct and glorious." "Then let us hear this meaning of yours which is so glorious!" said Yadava. Ramanuja then stood and with great humility recited the meaning of the verse. "The two eyes of the Supreme are as lovely as two lotuses that are blossomed by the rays of the sun." "I see," said Yadava. "You speak as though there actually was such a 'Supreme Person.' That is due to your childish ignorance. You have not learned your lessons properly. You should always remember that the Supreme is without form, without name, and without attributes. That is the teaching of the great Shankara. In the future you should not voice your foolish sentiments!" The words of Yadava were painful to Ramanuja's ears, but out of respect for his teacher he remained silent. A few days later a second incident occurred. While explaining a verse from the Taittiriya Upanishad beginning with satyam jnanam anantam brahma, Yadava said that Brahman was intelligence, truth, and the infinite. Hearing this explanation, Ramanuja politely added, "Brahman is endowed with the qualities of intelligence, truth, and the infinite— this means that He is not covered by ignorance as are ordinary living entities, He is never untruthful, and His energies are unlimited, not limited. The Supreme Brahman is the reservoir of all good qualities, yet He is superior to those qualities, as the sun globe is superior to sunlight." The agitation which Yadava felt within his mind made his voice tremble. "You young fool!" he shouted. "Your conclusions do not agree with those of Shankara or any of the previous masters! If you are going to persist with this useless talk about a personal God, why come here at all simply to waste my time? Why don't you start your own school and teach whatever you like? Now get out of my classroom immediately!" As Ramanuja rose from his seat and quietly left the room, Yadava began to reflect, "This Ramanuja is not an ordinary boy. If he starts his own school, the philosophy of devotion might become a threat to the philosophy of non-dualism. For the sake of preserving our doctrine, this fool should be killed!" Shortly thereafter, Ramanuja opened a small school at his home, and in no time many people began to come to him to hear his devotional discourses. Ramanuja's lectures were wholly theistic. He rejected the concept that the jiva, a living entity, could be equal to the Supreme Brahman or become God as postulated by Shankara. The living entity, Ramanuja taught, is a particle of Godhead, and as such, his position is to serve the complete whole. He said that as the hand is part of the body and thus a servant of the body, similarly the living entity is part of the Supreme and thus his constitutional position is to serve the Supreme. Ramanuja's philosophy became known as visishtadwaita or qualified non-dualism. Accordingly, the living entities are believed to be qualitatively one with the Supreme and at the same time quantitatively different. Ramanuja's assertion was that the quantitative difference means that the fragmentary parts of the Supreme are dependent on the Supreme but they cannot become the Supreme. The philosophy of Shankara stated that everything is Brahman and Brahman itself is absolutely homogeneous, undifferentiated, and without personality; individuality arose only due to illusion or maya. But this concept was staunchly opposed by Ramanuja. His philosophy stated that there can never be knowledge of an unqualified object; knowledge necessarily points to an object as characterized in some way. Ramanuja never admitted to an attributeless, undifferentiated Brahman, but rather a Brahman which is an attribute of a greater reality: Godhead Himself. He reasoned that as the living entities are individual personalities, so too is the Supreme also a personality—the Ultimate Personality. Neither the material world nor the living entities are conceived of as being independent of the Supreme Personality in the system of visishtadwaita philosophy. The living entities are a different manifestation of the Supreme due to their being endowed with free will, whereas the material energy is manifest directly under the will of the Supreme. The free will of the living entity is an all-important factor, since that free will is considered to be the basic principle of reciprocal relations between Godhead and the living entity. Ramanuja presented the living entities' relationship with Godhead as being one of eternal service. According to Ramanuja, when the living entities are freed from the illusions produced by the material energy by the method of devotion and natural love of God-like the dealings between an affectionate servant and his master—then the soul enters the spiritual sky known as Vaikuntha. Once having reached the Vaikuntha world, the soul engages in eternal service to the Supreme Person, Narayana (Vishnu). This sublime message was daily imparted by Ramanuja to his listeners. Seeing the growing popularity of Ramanuja and the influence which he had on the people of Kanchi, the proud and arrogant Yadava Prakash became restless. Gathering his faithful students by his side, Yadava said, "This impudent Ramanuja is a heretic! He is a nuisance to society and a threat to our doctrines of non-dualism. I can see no other solution to the problem than to kill this rascal! What do you say?" Yadava's disciples were in complete agreement with their teacher since they too were envious of Ramanuja. Thus they devised a plan to kill him. On the plea of worshiping the sacred river Ganges, Yadava and his disciples made arrangements for a pilgrimage to Banaras and asked Ramanuja if he would like to join them. Unsuspecting of their treacherous plan, Ramanuja accepted the invitation. As the group was about to depart, Ramanuja requested his cousin Govinda to accompany him. On the fourth day of their journey, Govinda was taken into confidence by some of Yadava's younger students who disclosed the plan to kill Ramanuja. Ramanuja resumed his normal life at Kanchi and did not reveal to anyone that his life had been in danger. Several months passed until one day, Yadava and his disciples finally returned to Kanchi after completing their pilgrimage. They were staggered at the sight of Ramanuja-alive and conducting his school as usual. Thinking that their plan might have been discovered, they became fearful and abandoned any further plans to kill Ramanuja. The fame of Ramanuja continued to spread far and wide. One day as Ramanuja sat in the solitude of his study, a venerable saint named Yamunacharya came to his door for alms. Extending his full courtesy, Ramanuja welcomed the saint into his home. Ramanuja learned that Yamuna was from Sri Rangam, the famous temple of Vishnu. In the course of their discussion, Ramanuja soon realized that Yamunacharya was a qualified spiritual master of the science of devotion. Overwhelmed with ecstasy and jubilation, Ramanuja fell at his feet and asked to be accepted as his disciple. Yamuna instantly raised Ramanuja up from the floor, and embracing him with deep love, said, "My child, I am blessed today by seeing your devotion to God. May you live a long and fruitful life always being intent in the service of Narayana, the Personality of Godhead." Ramanuja then circumambulated his guru to invoke auspiciousness, and Yamuna left for Sri Rangam. Then one day, a messenger came from Sri Rangam and informed Ramanuja that his guru was ill and on the verge of death. Ramanuja immediately departed for Sri Rangam, but was not able to reach there in time. Shortly before Ramanuja arrived, Yamuna left his body and entered the blissful realm of Vaikuntha. Crossing the river Kaveri, Ramanuja reached the island on which the temple of Sri Rangam was located, and went directly to the place where his guru was lying. Surrounded by a group of his disciples, Yamuna laid on a bed with his eyes closed, his arms outstretched at his sides, and his face shining as if immersed in thoughts of infinite beauty. Momentarily, everyone's attention focused on Ramanuja as he entered the room and came to sit by the side of his guru. Tears of love filled his eyes and he wept, his heart feeling great separation from his master. The left hand of Yamuna was poised in the yoga posture for peace, with three fingers extended and the thumb and forefinger joined together at the tips. His right hand, however, was at his side but clenched into a fist. All the disciples were struck with wonder about the position of their guru's right hand, and none of them could understand the meaning. As everyone looked on in wonder, Ramanuja broke the silence by declaring, "Our guru, the revered Yamunacharya, has three desires that he wishes to be fulfilled. I will protect the people in general who are deluded by impersonalism by bestowing upon them the nectar of surrender at the lotus feet of Narayana." As Ramanuja spoke, one of the fingers on Yamuna's right hand extended outward. Then Ramanuja said, "For the well-being of the people of the world, I will prepare a commentary on the Vedanta-sutra which will establish the Supreme Person as the ultimate reality." At this, a second finger extended, and Ramanuja continued speaking. "And in order to honor Parasara Muni, who in ancient times established the relation between jivas, living entities, and Iswara, the Supreme Person, I shall name one of my disciples who is greatly learned and devoted after him." Ramanuja then became silent and the third finger on the right hand of Yamuna extended. Everyone present was amazed to see this miracle, and from that day on they all accepted Ramanuja as their leader and guide. Ramanuja continued to live at Sri Rangam for the remainder of his life and in due course all three vows were fulfilled by him. Although he lived for many years as a successful householder, Ramanuja was destined to accept the path of renunciation. Eventually he took up the renounced order of life, sannyasa, by going before the deity in the temple and praying to be exclusively engaged in the service of Godhead. From that day forward Ramanuja always wore tilok —the symbol of Narayana— on his forehead, dressed in saffron cloth, and carried the renunciate's three-sectioned staff, which signified service to God by body, mind, and words. Feeling oppressed by the growing popularity of devotion, a certain group of impersonalists went to see the Chola king, Krimikantha, at Kanchi. Bowing humbly before the king, who was himself an impersonalist, they asked him to do something to stop Ramanuja. After some discussion it was decided that the king would invite Ramanuja to take part in a philosophical debate at the palace. Thus the king's messengers were sent to Sri Rangam to fetch Ramanuja. The king had it in mind to convert Ramanuja —by force if necessary. Once Ramanuja had been indoctrinated, he thought, then everyone in his kingdom would return to the fold of Shankara. After meeting with the king's messengers at Sri Rangam, Ramanuja prepared to go to Kanchi. However Kuresh, a wise disciple of Ramanuja, did not trust the intentions of the king, and pleaded with his guru to allow him to go in his place. Kuresh insisted, and Ramanuja had to submit. Kuresh then dressed in the saffron robes of his guru and appeared before the messengers with staff in hand. Thinking Kuresh to be Ramanuja they started for Kanchi. Meanwhile, dressed in white robes, Ramanuja remained behind. When Kuresh reached the palace, King Krimikantha greeted him with respect, thinking him to be Ramanuja. But later, when Kuresh refused to be intimidated by the behavior of the king, Krimikantha, in a mad rage, ordered his soldiers to arrest Kuresh and burn his eyes out. The king's men took Kuresh to a prison, and after blinding him, released him in the forest. During the entire horrifying experience Kuresh never once protested. He found strength within knowing that his guru was safe. With the help of some people from Kanchi who were appalled by the action of the king, Kuresh was able to rejoin his guru at Sri Rangam. Within a matter of days after committing that grave offense against Kuresh, King Krimikantha was stricken with an incurable disease and died a miserable death. At Sri Rangam, Ramanuja took Kuresh before the deity of Narayana, and with fervent prayers asked the deity to restore his sight. "O master of the universe, You are the protector and well-wisher of Your devotees. Kindly be merciful and renew the eyes of Kuresh, who without protest has made the supreme sacrifice." At that very moment Kuresh felt a gentle breeze blow across his brow and he immediately regained his sight. Ramanuja continued living at Sri Rangam, serving the Deity of Narayana and imparting enlightenment to whoever came to him until he was 120 years old. One day while worshiping the Deity, he prayed, "Dear God, whatever I could do to preserve the essence of the Vedas, to uplift the fallen souls, and to establish the shelter of Your lotus feet as the supreme goal in life, I have done. Now my body has grown tired after many years in this world. Kindly allow me to depart from this mortal world and enter Your supreme abode." With this prayer Ramanuja returned to the assembly of his disciples and announced his desire to depart from this world. Thrown into an ocean of grief, the disciples clasped the feet of their guru and petitioned him to remain with them. "It is unbearable for us to conceive of the disappearance of your divine form, which is the supreme purifier, the abode of all that is good, the destroyer of all afflictions, and the fountain of unlimited joy. Out of pity for your children, please stay with us for some time longer." "Always remain in the company of and serve those souls devoted to Godhead just as you would serve your own spiritual preceptor. Have faith in the teachings of the Vedas and in the words of the great saints. Never become the slave of your senses; always strive to conquer the three great enemies of self-realization: lust, anger, and greed. Worship Narayana and take pleasure in uttering the holy names of God as your only refuge. Sincerely serve the devotees of Godhead; by service to the great devotees, the highest service is done and one quickly gains the supreme mercy. Remembering these things you should live happily in this world for the attainment of the next." With these departing words, Ramanuja, keeping his head on the lap of Govinda and his mind fixed in spiritual trance, relinquished his mortal body and entered the realm of Vaikuntha. Ramanuja was indeed a great theologian whose life and teachings have had a lasting influence on the development of theistic thought in India. Ramanuja's introduction of the Godhead as the absolute entity with supersubjective characteristics —and his having pioneered the dawning of devotion to Godhead— opened the door for future theistic reformers who would in due course fully reveal the highest potential of the soul in a loving relationship with God and His eternal servants. "I take refuge at the feet of Sri Ramanuja, our venerable master, who, during the dark night of the impersonal conception of divinity, carried the torchlight of knowledge and thus illuminated the path of devotion to the Personality of Godhead." 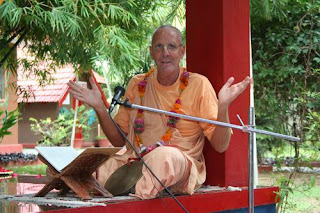 Pujyasri Swami Srila Bhakti Gaurava Narasingha Maharaja is the founder sevaite-acarya of the Sri Narasingha Chaitanya Ashram, Sri Rangapatna. Courtesy: Sri Narasingha Chaitanya Ashram website.